Note: this castle is not related to the mythical Avalon of Arthurian legends in any ways. At least, this Avalon castle did actually exist! 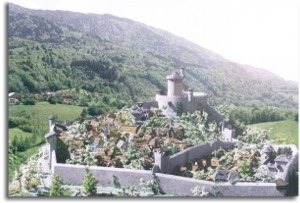 Avalon castle played a key role during all Middle Ages as the first line of defense of the Dauphiné province against Savoy (the border is just 3 kilometers (2 miles) away).